What Is an Entry Level Separation (ELS) in the Military? Not long after enlisting in the military, some people realize that the military is not for them. Sometimes this dawns on them during boot camp, other times it becomes clear during the first few months of service. 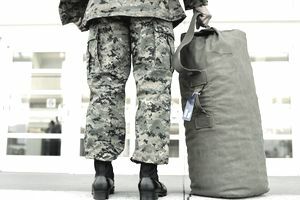 While you can't opt out of your contract with the military, there is something called an entry level separation (ELS) that applies to those who have been in the military for fewer than 180 days. But a new military member can't just ask for this type of discharge and expect to receive it. Here's how it works. The ELS is one way a commander can designate when someone is to be discharged from the military without triggering a court martial. When an enlisted person is discharged, their service is characterized based on conduct and performance. The possible characterizations include Honorable, General (under honorable conditions), Under Other Than Honorable (UOTHC), and Entry Level (ELS). There are two other possible service characterizations for enlisted personnel: Bad Conduct and Dishonorable, but those two discharge types are punitive, not administrative. These two types of discharge can only be imposed by a court martial. Many people confuse this with a kind of special separation program that allows them to quit if they have less than 180 days of service. If the servicemember has fewer than 180 days of service and is discharged, the commander can indicate that he didn't have enough time to adequately measure the person's conduct and performance by characterizing their service as "entry level." Instead of giving an Honorable, General, or Other Than Honorable discharge, the member's service is essentially uncharacterized. An ELS is not honorable, it's not general, it's not anything. It means that the commander didn't have enough time to make a fair decision as to the overall service characterization. Not surprisingly, a commander is not required to characterize your service as entry level even if you are still shy of 180 days of service. Your commander still has the option to characterize your service as honorable, general, or UOTHC instead. This is often done in cases of misconduct or failure to meet or maintain standards. The ELS is usually a complete failure of military standards (physical, mental, military bearing, other abilities) by the individual. The desire to stay in the military is usually absent in ELS-eligible individuals. Usually, someone with an ELS has not been in the military long enough to qualify for most veteran benefits. You are not considered a veteran at this point if you get selected for ELS. If the military member completely meets the standards of conduct and performance of his/her contract time expected of military members, the commander will characterize their service as "honorable" upon discharge. A person with an Honorable discharge is considered a veteran (in most cases) and is eligible for veterans' benefits. Despite the use of the term "under honorable conditions," a general discharge is not on the same level as an "Honorable" discharge. Ultimately, it indicates that the person screwed up and got kicked out of the military, but their conduct wasn't quite serious enough to warrant the most severe administrative discharge characterization. Those who receive a "general" discharge are eligible for most veterans' benefits, except those benefits that require an honorable discharge (such as the G.I. Bill). This is the worst service characterization that can be given for an administrative discharge. It means that the service member did not meet the expected levels of conduct and/or performance required of military members. Usually, a person with a UOTHC discharge is not eligible for veterans' benefits, but the actual decision is made on a case-by-case basis by the Department of Veteran Affairs.